Am I the only one who thinks this seems just a little surreal? Information about the history of Younkers is available at the links below. I have no idea as to the accuracy of the information. In case you don’t know anything about Younkers stores, they were probably ***the*** department stores for many of us growing up in the Midwest, at least for me in the ’60s and ’70s. (Anymore, for customer service and a few other reasons, I seldom step foot inside any Younkers store.) The Gates department store in Fort Dodge was a nearby favorite, as well. This entry was posted on June 14, 2010 at 1:20 am and is filed under Uncategorized. You can follow any responses to this entry through the RSS 2.0 feed. You can skip to the end and leave a response. Pinging is currently not allowed. I love this photo Louise! Lots to ponder when viewing! 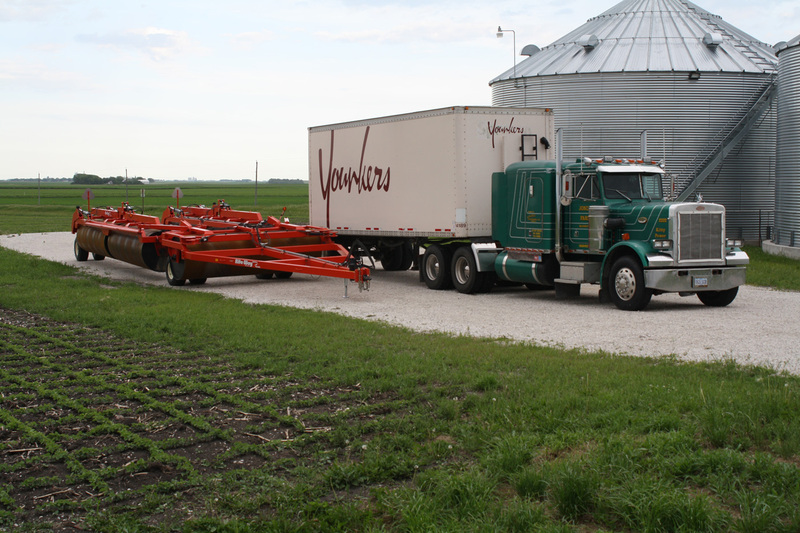 Do you suppose some farmer got a really good deal for a grain truck? Two other thoughts. Perhaps the farmer has a part-time job driving for Younkers. Or maybe the person just lives on the farm, but doesn’t farm at all, and is a truck driver for Younkers. Kathy: I’m glad you like it. The last two times I’ve been past that intersection, the truck has not been there. I kinda miss it! Clara: I bet the owner did get a good deal and uses the truck for storage or something farm-related and/or functional. very funny. At first I though perhaps this was Wagner but after reading the caption I see it isn’t.